In the aftermath of World War II, Osaka remains devastated. Food is scarce with bad harvests and rationing. The luckiest people stand in long lines for bowls of ramen. When Ando sees this, he realizes that something must be done to help people. He decides to dedicate his life to food, first opening a salt business and eventually following his memories of those hungry people to figure out how to make instant ramen. It was a long process of invention, trial and error. Once he created the perfect noodles, he moved on to trying to figure out how to create the broth too. He tried many things and continued to fail until he saw his wife frying tempura and was inspired to fry his noodles first. Eureka! This nonfiction picture book offers a frank and fascinating look at the process of the invention of instant ramen. From the original inspiration through all of the mistakes and trials to the final result. The book has a great pacing, lingering over the more touching moments of inspiration, zooming through years where Ando had other priorities, and then slowing once again to explore the experimental process of invention. The illustrations are completely appealing and often have a broad sense of humor included. They have a sense of motion and cinematic approach, particularly while Ando is inventing the ramen. Using panels, the ideas flow quickly and fail just as fast. The result is a cleverly designed book that inspires. Just as satisfying as a warm bowl of ramen, this is a delicious read. Appropriate for ages 5-8. Explore the story of how the popular board game Monopoly was invented in this nonfiction picture book. Lizzie Magie was a talented woman, someone who was very concerned with fairness in the late 1800s. During that time, wealthy people bought up property in cities and charged high rents for them. Maggie invented the Landlord’s Game, an early version of what would become Monopoly, with two ways to play. One was buying up and owning lots of land and the other was working together and demonstrating how fairness worked better. The game was complicated but popular with different versions being created across the country. When Charles Darrow, a man down on his luck during the Great Depression, was introduced to the game, he worked to improve it. Then he started selling it rather than sharing it the way it had been done. Soon Parker Brothers was interested in selling it. But what of Lizzie? Stone tells the poignant story of a woman with a real concern for society and the way it was headed. She created a complex game, shared it with others and was taken advantage of by the system that she was working against. Paid a nominal fee to give up her claim to the game, Darrow went on to become a millionaire in contrast. Make sure to read the author’s note at the end that shows how this book was originally about Darrow until Lizzie’s story emerged. The illustrations have a wonderful vintage quality to them, suiting the period of setting of the book. It is very interesting to see close ups of the different boards of the Landlord’s Game and eventually the very familiar Monopoly board. Even those who don’t enjoy Monopoly, like me, will be fascinated by the complex tale behind the game. A very intriguing tale that is a mix of women’s rights, ingenuity and economics. Appropriate for ages 8-12. This amazing nonfiction picture book takes a look at New York in the 1860s and the lack of options for transportation on the crowded and dirty streets. Everyone knew that something needed to be done, but no one could agree on exactly what that was. Then Alfred Ely Beach had an idea to build a railroad powered by forced air. Beach knew though that he couldn’t propose to create a railroad under the streets, so instead he proposed that he’d build a tube to carry mail. Even Boss Tweed agreed with the plan. So Beach set to work creating a railroad to carry people and not mail. But it was not going to be as easy as just building the machine. He still had Boss Tweed and above ground politics to deal with! Corey writes with great energy in this picture book. While nonfiction and historical, the book is fascinating and one immediately roots for Beach as he begins to plan and then dig under New York City. The slow digging under the earth is tantalizingly told. Then the rush of opening and the speed of the train are offered with a breathless tone and fast pace. The ending is sad but also hopeful, since everyone knows that air-driven trains are not the way subways were designed. There is a feeling of remembrance at the end, of one man’s amazing dream that led to other opportunities to tunnel under New York City. It is always a joy to see work by Red Nose Studios. The book opens with a look at how the illustrations are done with figures made from wire and foam and then polymer clay for the faces. There is such attention to detail throughout with the gorgeous tube-shaped subway car appearing like magic. Done with serious flair for the dramatic and a great sense of style, this picture book’s illustrations are noteworthy and wonderful. A great pick for fans of machines and inventions, this is also a book just right for dreamers of all sorts. Appropriate for ages 6-9. Reviewed from e-galley received from Penguin Random House and Edelweiss. Chester Greenwood is credited with being the inventor of the earmuffs. The story goes that he was a boy with big ears that were sensitive to cold so he had his grandmother create him a pair of earmuffs from wire and cloth. However, the author also shows that earmuffs were actually invented before Greenwood was even born. He did however get a patent himself at age 19 for ear-mufflers. Chester had a great business sense too, one that he honed even as a boy. He also invented other things besides ear-mufflers, designing new features into kettles and rakes and even creating a portable house. It was an article in Life Magazine in the 1930s that credited Greenwood with the invention and that continued into the 1970s when there was a day named after him in Maine that continues to be celebrated today. McCarthy immediately invites readers into the earmuff mystery, showing the early patents by others and then turning to Greenwood. Readers will see how convoluted stories can become in history, how distorted credit for inventions can be, and also how hard it can be to piece together the truth fully once again. It is to McCarthy’s credit that her focus is on more than the inventor but also on the others in history and the patent process. Don’t miss her notes at the end which detail even more fully her search for the truth about earmuffs. McCarthy populates her books with friendly characters with big googly eyes. Her paintings are fresh and colorful. They range from double-page spreads to smaller images on the page. All of them exude a cheery feeling and invite readers to explore. This nonfiction picture book embraces the complexity of the past and demonstrates the search for the truth behind an everyday object. Appropriate for ages 6-9. Reviewed from copy received from Simon & Schuster. Ben Franklin grew up the son of a soap maker and loved to spend his free time on summer days swimming in the river near his home. In the time of his childhood, people just did not swim or wash regularly because they thought it would make you sick, so Ben was considered rather odd for the amount of time he spent in the water. As he swam, Ben started to wonder why it was that fish swim so much better than he could. And so Ben starts to come up with inventions that would help him swim like a fish. First, he made swim fins for his hands out of wood and they did make him much faster, but they also made his wrists sore and tired. The next invention was swim sandals, but they didn’t improve things much since they slid off his feet. But Ben was not a quitter and so he took each defeat as a way to improve his idea. After all, he was a scientist through and through. Rosenstock sets just the right playful and rather silly tone with this biographical picture book. She includes plenty of details about the society in the 1700s and how it was different from our modern one. Using different fonts and repeating words, she also emphasizes the importance of trial and error in science and solving problems. She also ties in the fact that this is how science works and how scientists learn things, along with a healthy dose of dedication and resolve. The illustrations by Schindler are marvelous, cleverly covering up the more private parts of the naked swimming boy with splashes and waves. They have a light-hearted quality to them and also a visual lightness that makes the book even funnier as they swim across the page. A book to inspire children to try to solve problems they discover, this is a fresh and summery look at a boy genius at play. Appropriate for ages 5-8. After the Eiffel Tower stunned World’s Fair visitors in 1889, it was up to Chicago to impress people at their 1893 World’s Fair. So a nationwide contest was announced, but unfortunately many of the designs were just slightly-modified Eiffel Towers, so all of them were rejected. George Ferris was an American engineer who had already designed big bridges, tunnels and roads across the nation. He had an idea for a structure that would not just rival the stature of the Eiffel Tower, but would also move and be able to be ridden. The judges of the contest reluctantly agreed to let him try, but would not offer him a penny of funding. Ferris managed to find a few wealthy investors to help him and construction began on the huge project of creating a delicate wheel that would be strong enough to turn filled with people. The tale of the building and invention of this now iconic ride is rich with suspense and the delight of accomplishment. Davis has written a very successful picture book biography on George Ferris and his delight of an invention. Occasionally in the text, there are sections in smaller font that offer more details and information. It is all fascinating and those sections will be enjoyed as much as the main text. Davis clearly explains differences between today and the late 1800s, such as the lack of Internet to carry ideas. The story has plenty of dangers, lots of action and the ever-present danger of failure to carry it forward and make it enjoyable reading. Ford’s illustrations are filled with rich, deep colors that capture different times of day. They are a winning mix of straight, firm lines and hand-drawn characters and structures. The play of the two on the page makes for illustrations that are eye-catching and that draw you into the story and the time period. This is a particularly strong picture book biography that children will pick up thanks to the everlasting appeal of the Ferris Wheel. Appropriate for ages 7-10. Nikola Tesla was born in Serbia during a lightning storm, something that would portend his future interest in electricity. At a young age, Tesla became fascinated by the invisible energy everywhere around him, in the water, the wind and the insect that flew. In college Tesla grew interested in alternating current though his professor thought it was impossible. Tesla studied and invented and eventually figured out how to make alternating current work, but he needed help. He headed to America to meet with Thomas Edison, someone he knew would be interested. But Edison was not, insisting that direct current was the only electricity he would work with. Soon Tesla and Edison were rivals in the “war of the currents.” This first picture book biography will introduce young readers to one of the great scientific inventors of all time and his greatest rival too. Rusch tells the compelling story of Tesla and his inventions. She shows Tesla as a complicated person, eager to pursue his own ideas and willing to stand up for them in the face of great opposition. She also tells the story of the rivalry of the two men in a very engaging way and Tesla’s ultimate victory and how he reached it. Her writing is engaging, detailed and impressive. Dominguez’s illustrations are filled with period details that help ground this picture book directly in the time in which it is set. Scientific instruments are often in the forefront of the images, showing their structures in detail. This is a true celebration of the science of invention. An electric read, this book shines light on a great man. Appropriate for ages 7-9. Reviewed from copy received from Candlewick Press. This picture book version of the nonfiction book manages to translate the story of William Kamkwamba with clarity and inspiration. When a drought hit his village in Malawi in 2001 and 2002, 14-year-old William and his family were in real danger of starving. William had always through about machines and even after he was forced to leave school due to the drought, he kept reading books about them. He thought about what could be done with a windmill in his village, bringing light and water. So he hunted through the junk yard and found pieces to use. Built entirely out of scraps, his first windmill and its electric wind brought electricity to the valley. The afterword gives more details about William’s story and how it took him longer years to bring his dream of pumping water to fruition. This inspirational story speaks to the inventor, the doer, and the dreamer in all of us. The writing here is lovely. The imagery is impressive, such as comparing the windmill to a “clumsy giraffe” and giving William’s sorrow at having to leave school a physical sense: “alone with the monster in his belly and the lump in his throat.” The book carefully captures what life in Malawi was like and what little could be done to make a difference before transforming into a book where dreams create change. Zunon’s illustrations are exquisite. They are a captivating mix of painting and collage. Filled with texture, the textiles of the clothing come to life and the objects have weight and feel. The most impressive are the faces of the people, filled with light. The faces become the place your eyes go first, making the message of the book just that much stronger in a subtle but powerful way. A luminous picture book version of a compelling real-life story, this book should inspire others to not only dream but to make those dreams happen. Appropriate for ages 7-10. Reviewed from copy received from Dial Books for Young Readers. 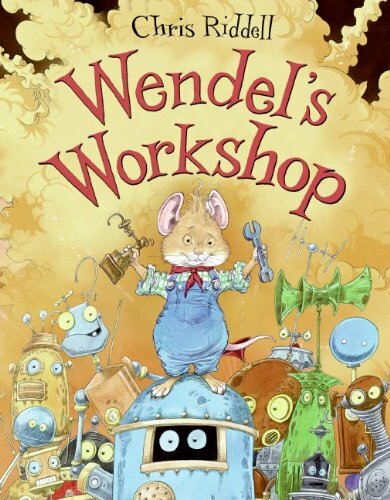 Wendell was very busy inventing things, so he didn’t have time to clean up his workshop. When it finally became too untidy to bear, Wendell invented a robot named Clunk to help him. Clunk did the housework, but in such a way that it made an even larger mess. So Wendell threw him down the rubbish chute. Wendell created a second robot to help clean. This robot looked a lot like him, so he called him Wendelbot. Wendelbot was great at cleaning, but too great. Finally Wendel himself was the only untidy thing left, until Wendelbot threw him down the chute. Wendel found Clunk there and they devised a plan to stop Wendelbot in his quest to tidy the world. Riddell has created a robot picture book that has a great story yet resists being too wordy or complex for young children. The book reads aloud very well, filled with great sound effects, wonderful big booms, and plenty of clutter. It is a story that all children will relate to happily whether they love robots or not. Riddell also laces his story with plenty of humor, which is carried directly into the illustrations. Wendel himself is very cute and fuzzy, a wonderful contrast to the hard surfaces of the robots. The detail of the illustrations is delightful, from the rolling screws to the intriguing depths of the rubbish pile. This is a picture book with lots to love plus robots! Appropriate for ages 3-6.